Why is childcare such a hard sell in the federal election? Spending on early years education seems to be a tough sell for politicians. A significant number of Australians, both politicians and voters, see “childcare” as a service to help parents get back to work, despite growing recognition that early education is important for children’s learning and development. The discussion tends to focus on household budgets and the ability of mum (mostly) to go back to work. While these are important issues that families face every day, we don’t treat school in this manner – we don’t make decisions about whether children can go to school based on how much their parents work and earn and, likewise, this shouldn’t factor into decisions about young children accessing quality early learning. Education is figuring strongly in the election campaign, but the focus has been on Gonski reforms and the funding each party is willing to make available for schools. Both the Coalition and Labor have said that we need to target spending on schools. But neither party is focused on where spending can make the most difference – the early years before school starts. In the federal budget the government shelved its early learning policy for at least another year. 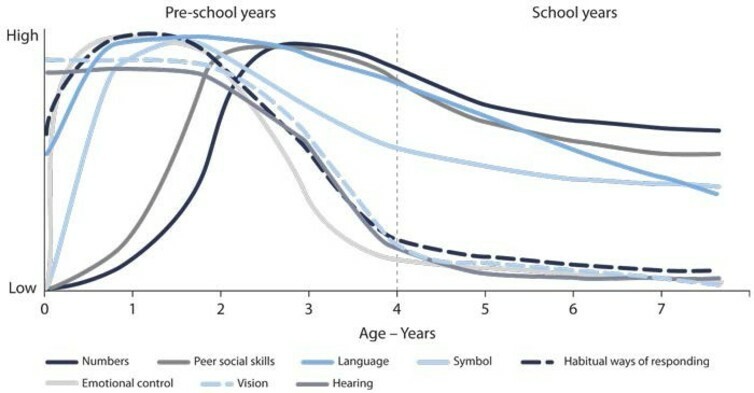 Children’s sensitivity to learning in many areas, such as language and understanding symbols, peaks before the age of five. Foundational skills such as peer relationships, emotional regulation and behaviour, problem solving and planning are also developed in the preschool years. It is up to governments now to heed the evidence and be bold with their policy proposals – put aside some payment for play based learning. Parents are their children’s first and most important teachers, but high quality early education also has positive impacts for all children and particular benefits for disadvantaged children. Children who attend preschool are more likely to be ready to learn when they start school. They are likely to do better on NAPLAN and have higher maths and literacy levels. We know that there is a widening gap in learning outcomes – it is evident when children start school, and it grows over time. We end up with a quarter of young people not fully engaged in education, training and employment at age 24. What is less well known is that these performance gaps are can be predicted (and changed) much earlier on. Given this weight of evidence, investment should be flowing into the early years, but it’s not. There is a big difference in the way government talks about childcare and the way child development experts talk about early learning. Research shows that many Australian families are unaware of the science of early childhood learning and development. Quality play based learning with peers in early education and care supports children to develop greater confidence and resilience in school. As a result, families tend to think of childcare as a safe place for children to be while they work, whereas experts think of early education and care as a place that can amplify children’s learning and help build their social skills and emotional regulation. Part of the problem is that the Australian government has historically funded childcare primarily to encourage women to participate in the workforce. The government’s language around childcare subsidies is intrinsically linked to the workforce agenda – the government’s policy is entitled Jobs for Families rather than Outcomes for Children. Government funding of early education and care is seen as something that helps household budgets, not an investment in children that is essential for future jobs and growth. Yet early education is an investment that is equally important as our longstanding national commitment to ensuring all young people have access to a school education. Government has a role to play in reinforcing the pivotal role of early learning in building children’s capabilities. One step in the right direction would be for government to commit to sustainable, ongoing funding for universal access to preschool in the year before school. There is currently a short-term National Partnership Agreement to provide 15 hours of early education to children in the year before school, but many children are not accessing the number of hours needed to make a difference and cost remains a barrier for some families. Establishing preschool education as a legislated entitlement equivalent in status and importance to primary and secondary schooling, would bring Australia into line with other OECD countries. This would help in part to re-frame the community’s views around the impact of preschool. To shift the focus from “childcare” to “early education”, we also need a public education campaign to give families access to information on the science of children’s learning and development. Communicating the key insights of cutting-edge science in ways that resonate can help create community support and public demand for investment in the early years. There is great demand for more information from parents, but we need to communicate these messages more effectively. A national campaign could also help build community understanding of what high-quality early education looks like and why it matters. Australia’s National Quality Framework does a good job of setting benchmarks for a quality early education and care system, but is not well understood. Early Learning, Everyone Benefits is a grassroots campaign aiming to shift community perceptions – government could fast track its impact by committing to ongoing funding to this vital education sector. The challenge is to ensure workforce participation imperatives do not undermine access to quality early learning for all children.